If you’ve been wondering how to start a WordPress blog for your handmade business, I’ve got you covered! You know what, even if you’re not sure if a WordPress blog is right for you, stick around and we’ll talk through the pros and cons so you can make the best decision for you, your business, and your customers. 1 Why Start a Blog for Your Handmade Business? 1.1 So, What’s the Downside? Why Start a Blog for Your Handmade Business? At the time of this writing, it was just over a year ago that I was an exhausted handmade seller. I was recovering from the inevitable stress and overwhelm that come from being a professional maker during a busy holiday season. I was doing all-the-things: online marketing, making products, managing my Etsy shop, working the craft fair circuit, and taking any order that would come my way and I realized….people still don’t know who I am or why they should buy my products! See, even though I was doing all the “right” things, I wasn’t building a brand and I wasn’t building relationships with my customers. To them, I was just another nameless, faceless business, but I wanted more connection to them and I realized there was something I could do about it. I had heard about other sellers who had started blogs in order to engage more closely with their customers and in order to set themselves apart from hobby-businesses, foreign importers and, well, Walmart. And that’s what I wanted! At the same time, after having my pattern go viral and seeing lives changed by the impact that financial freedom can create, I knew that I wanted to help other handmade sellers to build their own businesses. So, I started Crochetpreneur. It would be the best of both worlds: I planned to share my Made with a Twist designs and my business tips and resources. sell directly from your own site. See, there are A LOT of benefits to starting a blog for your Etsy shop! Honestly, starting a blog isn’t for everyone. If you’re the type of seller who simply wants to put your products up for sale and wait for them sell – without working on photography, without researching keywords and rewriting descriptions, without marketing, without building relationships with your customers, and without investing in your business – then blogging probably isn’t for you. There’s no condemnation in that, everyone wants to run their business differently. However, there is some evidence that the most successful handmade seller/bloggers share certain traits. If you share them, too, blogging might be for you. Sticktoitiveness – also known as tenacity and perseverance. Blogging can be hard, frustrating, and isolating. Successful bloggers stick to a problem until it is solved. Self-motivation – no one is going to sit over your shoulder and make you create content and build your blog. Successful bloggers own their process and get things done. Problem-solving skills – in my experience, there is no end to the tech troubles you might encounter as a blogger. Successful bloggers know how to seek out answers and ask for help when necessary. Innovation – be they systems, products, or relationships, successful bloggers are always looking for ways to make things better. Creativity – it seems this should go without saying, but I need to add it here. Successful bloggers find creative solutions help the world to see the world in new ways. Generosity – when you give freely you get noticed and the world gives back either through making a purchase or spreading the word about your business. Successful bloggers share the time, attention, and wisdom. Focus – it is so easy to get distracted by social media, new technology, and what other people are doing. Successful bloggers put their heads down and get the work done. 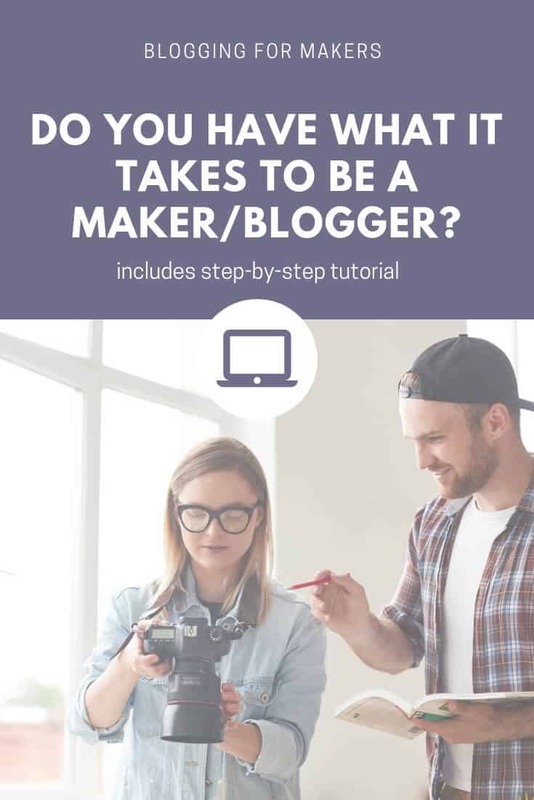 I know that seems like a lot and maybe you’re thinking blogging isn’t for you. But let me tell you, all of those traits boil down to one thing – successful handmade seller/bloggers are go-getters. They know what is best for their business and they get it done. What I already know about you, (a) since you’ve read this far and (b) because you are already, or you’re thinking of becoming, an Etsy shop owner, you are a go-getter. You’ve already taken the risk, done the work, and jumped into the world of handmade selling with both feet! It seems to me that you’re ready to take the next step and take your business from hobby-seller to professional business owner. Part of that process is building your own website for your brand and, then, starting a blog to continue building a relationship with your customers. Your people are waiting to hear from you. They want to connect with you and know more about your brand, your mission, and how you can help them. Don’t rob them of that opportunity by sitting on the sidelines and waiting for them to come to you. You go get ’em! Here, I’m going to walk you through starting a WordPress blog on Blue Host. I recommend Blue Host because of its excellent customer service ratings, low introductory rates, and (yay!) free domain registration. I think you’re going to love them and if you have any trouble in the process, just start a chat with customer service or give them a call. They’ll be happy to help you with the process. or, if you already have your domain, just select your hosting package and connect your domain later. On the next page, add your account information, confirm your package selection, add package extras. Here, we suggest you select domain privacy protection. Once you’ve entered your payment information, agree to Blue Host’s terms and conditions, click the green submit button and you have a website! After you select a theme, you’ll be taken to a screen that looks like this. Go ahead and select “business” since that’s why you’re starting your blog. It’s OK if you don’t have your actual business set up yet – this is part of the process of getting you there. When you get to your dashboard, your blog will be in “Coming Soon” mode. You can get to your site by clicking “Visit Site” at the upper left-hand corner of your screen. From there, you can see what your site will look like when it is launched. You can even play with your themes to see if there’s one you just love for your blog. Remember, you can change your theme at any time. Now, whenever you return to Blue Host to work on your site, you’ll log in to this screen. Simply select “My Sites,” click on the site you want to work with, and you’re off! When you’re first starting out, I suggest you use a free theme, but once you start making money, if you’d like to expand to a more customizable option, I suggest the Genesis Framework with a Child Theme. Once you’ve got the blog set up the way you’d like, go ahead and launch it to the world! To launch your blog, just return to your dashboard and click on the blue “launch” button. You’re live! Yes! You’ve always wondered how to start a blog for your Etsy Shop and now you’ve done it! Now, don’t be afraid to launch. When you first start, people aren’t going to know how to find you. Your SEO will take some time to help you get found on search engines. So, just launch and get to work creating content, connecting to your Etsy shop, and gathering up those emails so you can start building a relationship with your people. I’m so proud of you for taking the leap. Won’t you share a link to your new website in the comments below? I can’t wait to check it out!